Jenny from Crazy About Cricut here, and I'd like to welcome you to the next Action Wobbles Challenge and Wobble Wednesday Challenge. 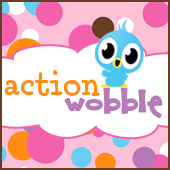 In case you haven't heard, we want to have all our wobbling in one place, so we're moving everything here to the Action~Wobbles Blog. You can get daily Action Wobble inspiration from the design team, find out how to "get caught wobbling", and more! To find the weekly challenge, just click the Wobbles Challenge tab at the top of the page. You can also click HERE. Congrats Mary! Love your card. Jenni your project looks yummy. Can't wait to watch the video. Just wanted to let you know that your video is coming up as private. We can not view it. I am so disappointed. I love your videos. The action wobbles make me laugh. Great video! Love your project!!!! !